The secret of our Mac Bride Principles campaign was its reasonableness and limitation – and, above all, that it anchored the issue right here in the United States. 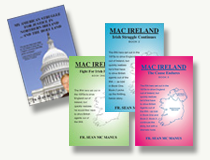 It did not try to tell the British, the Irish, the Protestants or the Catholics what to do. It just said: Whatever the solution over there is, one thing is certain — American investment dollars should not subsidize discrimination. That is how companies try to wiggle out of their responsibilities. We must not facilitate them. We must stick to the one issue: fair employment by American companies doing business in Israel-Palestine … so that American principles follow American investment. And remember our trump card: these Principles have already been signed by many American companies in regard to Northern Ireland, passed into law by 18 States and many cities and towns, and passed into U.S. law in 1998. 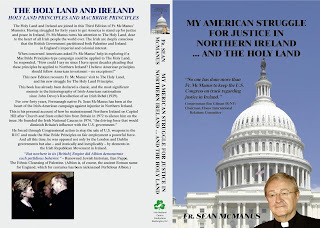 (1) The proclamation of the Holy Land Principles —never been done before. (2) Joining the two issues in his Memoirs: My American Struggle for Justice in Northern Ireland… And The Holy Land — never done before. These American principles must follow American investment wherever that investment is – no exceptions. On our Web Site — HolyLand Principles.org — we list all 573 American companies doing business in The Holy land. One list gives the contact details of the CEOs. The other list gives the contact details of the Investor Relations Contact (IRC), the person who deals with the issue. Importantly, his/her email is included, making it easy for you to lobby them. Please contact the IRCs – early and often! Urge them to advise the Companies to sign the Holy Land Principles. Remind them that they received a copy of the letter Fr. Mc Manus sent to their CEO, plus a copy of the book. (Fr. 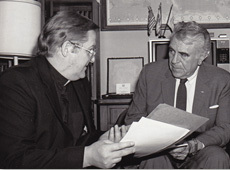 Mc Manus sent both the CEO and the IRC a copy of his book). Since this book states the case and frames the issue perfectly, urge the IRCs to read the book and become conversant with the issue. The fact that a book was sent to both the CEO and the IRC underscores the seriousness of this campaign. It ought to wonderfully focus their attention. 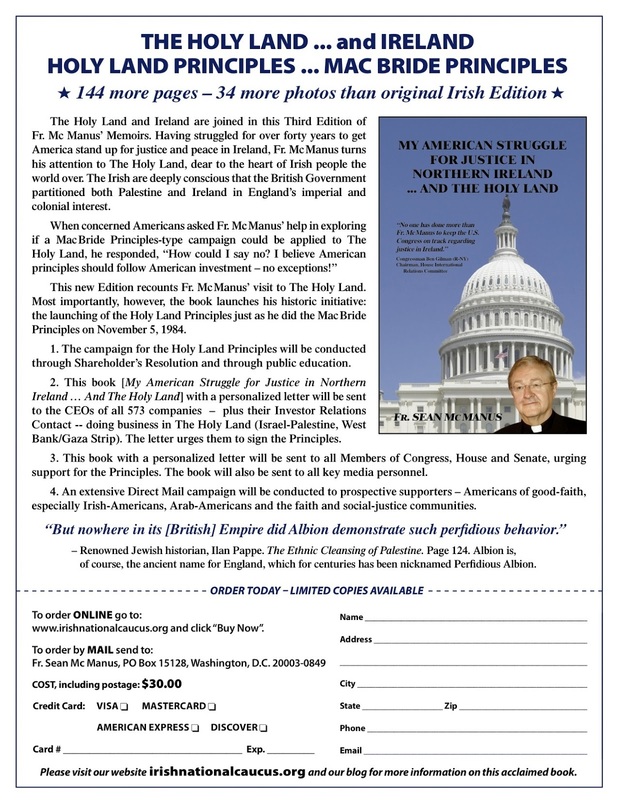 Then tell the IRCs that when they have read the book, you want to meet with them in person if they are in your area. (Of course, you have to make sure you have read the book yourself. You can hardly expect the IRCs to take the book seriously if you don’t yourself… It would be a bit like urging others to read The Bible while not reading it yourself). Go forth … and make these companies good Americans. 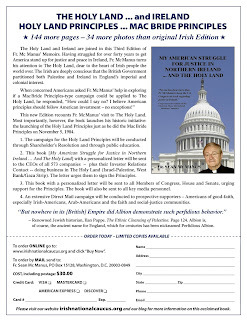 CLICK ON FLYER AND BOOK COVER TO ENLARGE.